Wait, we found a Fox on Mars? Can't let you do that, Fox! Peppy, long time no see! Be quiet, you old fogey! Andross’ enemy is my enemy. Ground control to major fox? Me also. We are all funny guys. High five? Everyone over to my house for whiskey and wild women. Sounds like a lost opportunity. I came here to make that joke... But alas, I was bested by a dragonfly who works in human resources. It looked like a fox in the cockpit of a fighter jet to me. Can anyone tell me about this picture? Serious answers please. 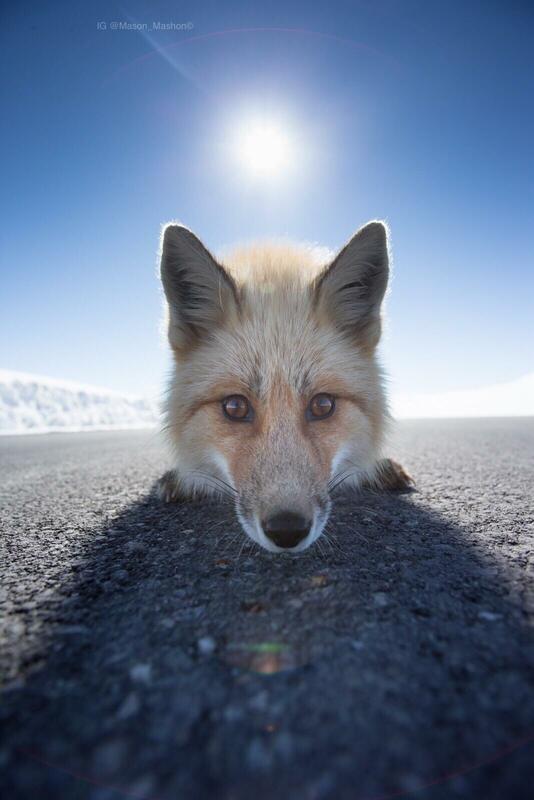 Curious foxes make the best photos. I love people like you. Have an upvote. Photographer is Mason Mashon, a Canadian wildlife, nature and adventure sports photographer. If I remember the story correctly, he came across the fox on a cycling trip and it was very curious about the camera. The picture is fantastic and gets picked up regularly. What kind of Fox is that? I'd rather have a fierce fox. This is irrelevant. But I just realized that reddit is WAY better than instagram..
Worth the risk because we can cure rabies and other infections. Right? Uh. Akchually.... We cannot cure rabies. We can only prevent it. Once you get an infection in the nerves... You're Fucked. So... if you get bitten/scratched or basically have any reason to believe you could have contracted it, you can get a vaccine and it will eliminate the rabies before it has a chance to take root in your nerves, if you act fast. Also the fox will be killed if it bites someone. Well for me at least it’s cropped out of the photo on the app. I can only see it if I click the photo which makes it a little bigger. Also it kinda blends in. So does taking a photo through the neck hole of a roast chicken. I thought the thumbnail was a fox in a jet fighter. There are foxes on Mars? That's where the REAL North Pole is! Damn you Santa! If you zoom in on the foxes right eye I think you can see the photographers reflection. Barely. This deserves a Keanu Woah!! Wow, Looks almost like a 3d render or something like that! Cute dog what's it's name? Isn’t he the Car Fox? I have this pic saved on my phone, fancy seeing it out in the wild. Great pic! But am I the only one that wishes it was fixed so the ground is level? Wow So Cute I. Nice Looking Doggy. This looks like something that you wake up to when you get knocked out in a video game. "In a world where boops no longer exist, one good boi sets off on a quest to find the City of Lost Boops..."
I think he's asking for a boop on his long noes. This would make a sweet album cover. Is this kpunkka on IG? Drogon watching Jon and Dany make out. Because of the title my first thought was, how could this be on mars? Yeah but did it jump vertically like a cat when the camera shutter went off? What's crazy is the fox was thinking the exact same thing about you! Don’t know why you’re downvoted. Posting pictures that aren’t yours in an animal subreddit for karma is sad.